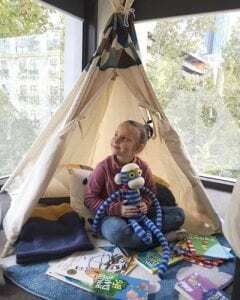 With the adults enjoying the newly refurbished hotel room, the kids can jump into a world of make-believe and fun with their very own tee-pee, blankets and games in the surroundings of their own personal tree house in the Melbourne CBD. It is the ultimate Kids Glamp-in. A stay in the exclusive Temple & Webster Glamp-in setup. We have set up the room with a tee-pee, blankets, toys and books which has been designed for kids of all ages! Buffet breakfast for 2 adults plus don’t forget that it’s the Holiday Inn brand promise that kids 12 and under stay and eat free! Please note: This package is only available on Friday, Saturday and Sundays. Note: This package must be booked 7 days in advance. The minute we entered the doors to the Holiday Inn Melbourne on Flinders we were warmly greeted by hotel staff. Valet offered to assist us with hotel parking and then reception staff seamlessly checked us in and kindly direct us to our room. There were squeals of delight all round as we entered the newly refurbished hotel room. A designated kids area featuring a teepee with books and soft and cuddly toys immediately occupied our kids as we settled ourselves into our room. We ordered some offerings from the in-room dining menu which arrived quickly and received a unanimous nod of approval from the kids (husband included). We all had a chuckle as we made our way through the chatter-box cards. Later that evening we kept the blinds open as we admired the city lights from our floor to ceiling windows. No hotel stay isn’t complete without a full buffet breakfast and we certainly were not disappointed. The kids enjoyed waffles and pancakes while I loved the fact I was able to make my own juice. A wonderful staycation overall and we cannot wait to return! Isabella and Eliza are the daughters of Every Day Mumma Samantha Monoghan. Long time viewers of the hit Channel 10 TV show “Offspring” may recognise Isabella, as she played Zoe Proudman from eight months old! Temple & Webster were thrilled to work with Holiday Inn to create the Kids Glamping Package. We selected a range of our favourite pieces to ensure that kids of any age would love spending time in this fun zone, and hope it brings joy and a sense of fun to their stay. Melbourne is the city where all year round there is something going on. From sporting events to concerts, there is always something on to keep families entertauned. Why should you choose Holiday Inn Melbourne on Flinders? Kemmons Wilson started the Holiday Inn brand in 1952 with the belief that families shouldn’t have below standard accommodation just because they have kids. Moving forward to 2018 we have taken that just a little step further. From our amazing front guest experience staff to our housekeepers all of us know that the joy of travel starts with a smile. Rates are per room per night and subject to availability. Bookings must be made 7 days prior to check in. Only one package is available per night.